This is from a June, 1992 trip to Washington State. We went to Mount Rainier and camped for a couple days. I was traveling with all my painting gear, and we hiked in to paint Carbon Glacier. To get there we had to cross a 100 foot or so swinging bridge over the river from the mouth of the glacier. We hiked up the side of Mount Rainier to a place on the side of the mountain that was just a little wider than the rest and I set up and painted. There were rocks falling from above us, and more falling down Carbon Glacier. The water coming out of the river below us had a consistency of what looked like snot. We sat on the edge of that cliff for 3 or 4 hours while I painted this picture. I had no intention of crossing that bridge again, so I finished that painting before I went back in. I like the violet glacier with the sharp cuts and drops with snow in them against the white snow covered mountain and green vegetation on either side of Carbon Glacier. Notice the red accents in the glacier and the vegetation. Also, Ann ended up quitting smoking on that trip. 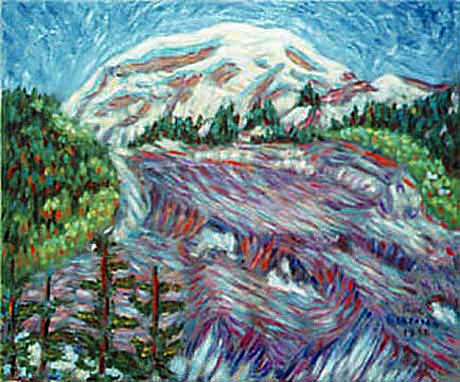 PaulB's Pointillistic/Impressionist original oil paintings of Mount Rainier and various prints and poster formats of a wide variety of subject matter by the Pointillistic/Impressionist oil painter from landscape/waterscape paintings, dance, sports, portrait, to classical figures, flowers, rock and roll, Brazil, and Mount Rainier paintings and prints are available for purchase for as little as $24.95 for an 8" x 10" matted print on photo pape. Pointillistic/Impressionist Giclee prints of Mount Rainier on real canvas or heavy watercolor paper are available. One of a kind Mount Rainier embellished prints, which are Giclee prints retouched in genuine oil paint by PaulB. Unless noted PaulB's original Pointillistic/Impressionist oil paintiings are oil on canvas. Paul Berenson's pointillistic/Impressionist oil paintings are in privale collections around the world, including the downtown Los Angeles Athletic Club and have appeared in numerous publications, including the New York Philharmonic Playbill. PaulB.com also builds websites and PaulB is a member of the LA Web Professionals Group.